Edna Jordan Smith holds a Masters of Education Degree with an emphasis in Historical Research. She currently teaches Genealogical Research at the Bluebonnet Genealogy Library in Baton Rouge. She also served on the Lieutenant Governor's African-American Site Identification Project for Tourism and served as consultant to selected history teachers and students in the New Orleans Public Schools. 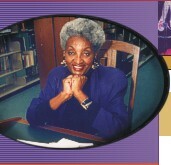 Mrs. Smith is the founder of the Afro-Louisiana Historical & Genealogical Society, an organization dedicated to expanding the knowledge base, sources, community consciousness, and education regarding the historical, cultural, and genealogical heritage of African-Americans in general and Louisianians in particular. Mrs. Smith has received many awards and is recognized nationally and internationally. She has presented scholarly papers and conducted numerous workshops and seminars on her various areas of expertise. In addition to coordinating exhibitions at Louisiana State University's Special Collections Library, she has served as Project Coordinator for parts of the Annual Conference of Afro-American Historical & Genealogical Society in Washington, D.C.
Mrs. Smith conducted the research to locate the Pre-Civil War Black Canadian Community with Louisiana roots. She subsequently organized their first pilgrimage back to Louisiana in 1986. As a result, she was featured in Home to Buxton, the popular Canadian documentary that features the story of that community. The creation of Afro-Louisiana Historical & Genealogical Society (ALHGS) was inspired by the encouragement of Ms. Jean Sampson Scott, an officer of the National African American Historical & Genealogical Society in Washington, D.C. It was through her friendship and generosity, coupled with her selfless guidance that ALHGS became a reality and was incorporated in 1987. It is in her memory and the need of a people that the work of ALHGS continues. ALHGS is guided by a 10-member Board who are experts in their fields. Our services will always be accessible. We can be contacted either through e-mail, the use of the Federal Postal System, and/or via the telephone.